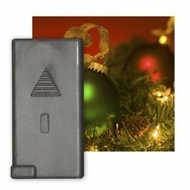 The RCA2220N is a supplemental pre-recorded Christmas Holiday Sound Card for use with the Honeywell MyChime products RCWL2200A and RCWL2205A. Great for customizing your door chime to the holiday season, you can greet your guests with festive tunes to match the season. The available tunes on this sound card are "We Wish You a Merry Christmas", "Jingle Bells", "Joy To The World", "Deck The Halls", and sleigh bells jingling.